Q. Who is eligible for the certification program? have lived experiences in recovery from a signifcant mental health or substance use disorder. have been in recovery for at least one year. I have at least a high school diploma or equivalent. Q. My application is not complete. May I send in part of the application documents now and part of the documents in the future? $20.00 check or money order made out to "PSS-BHS"
All documents must be included in the packet before mailing. Q. Where can I find a recognized, certified Peer Support Specialist Training Program (minimum 40 hours program)? A: Please see the PSS Certified Curriculum Programs at http://pss.unc.edu/courses for a current listing of approved curriculum for the 40 hour minimum training requirement as well as the contact information associated with each course. Q: Do I need to attend a certified Peer Support Specialist Training Program (40 hour minimum) in order to become a Certified Peer Support Specialist? A: Applicants for consideration to become a NC Certified Peer Support Specialist must complete Division approved training curriculum for Peer Support Specialists. The list of these trainings is found at http://pss.unc.edu/courses. Q: I took a recognized Peer Specialist Training Program Completion Certificate course that was more than the 40 hour minimum requirement. Can I apply the hours beyond 40 toward the Specialized Training Completion Certificates, minimum 20 hour requirement? Q: Where can I take the Specialized Training Completion Certificate’s (minimum) 20 additional related hours? A: You can receive the additional 20 hours from a variety of organizations. These organizations may include community and professional groups, faith based organizations, and private training providers. Q: What types of training qualify for the 20 hours of specialized training? Q. Will my college course work fulfill the Specialized Training Completion Certificate’s (minimum) 20 additional related hours? A. Yes, if the course work is related the work of a NCCPSS and will enhance the ability to provide services to people with mental health and/or substance use disorder. The applicant must submit an official transcript for review with the application packet. Q. Who oversees and administers the Peer Support Specialist Registry? A. The NC Certified Peer Support Specialist program is an initiative of The North Carolina Division of Mental Health, Developmental Disabilities and Substance Abuse Services. Certificates carry The Great Seal of the State of North Carolina. 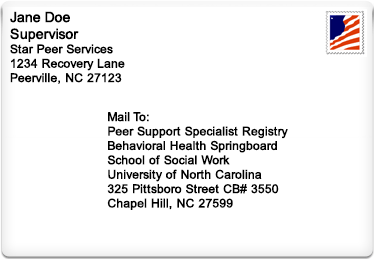 Behavioral Health Springboard at the School of Social Work, University of North Carolina in Chapel Hill administers the NC Peer Support Specialist program on behalf of the state. Q. Where do my personal references and supervisor sign the envelope? A. Your personal references sign across the seal line where the flap meets the back of the envelope. In the illustration below, Jane Doe is acting as a personal reference and is submitting a Personal Reference Form. 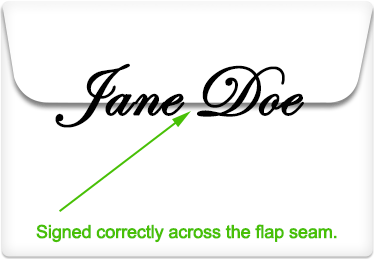 She signs her name "Jane Doe" on the back of the envelope, over the flap seal. In order to be accepted, all Personal Reference Forms must be received in sealed envelopes, signed by the personal reference in this way. Q. My personal references signed the forms, but did not sign the envelopes. Can I submit the forms without the envelope signatures? A. Personal Reference forms that are not submitted in envelopes signed over the flap by the author of the form will be returned. The application will be on hold until the forms are submitted with signed envelopes. Q. Should I submit the reference forms together with the application? A. Please send all the required application documents together in one large envelope. Personal Reference Forms should be included in the application packet in order for the application to be complete. Sending a completed application expedites the certification process; sending incomplete applications slows down the certification process. Q: How do I become a trainer for the 40-hr CPSS course? A: New requirements for course trainers are listed on the document "North Carolina Peer Support Specialist Trainer Registry" found on the website. In addition, a trainer must be approved by at least one of the course developers in order to train on that approved course. Q: Where do I go for training to become a trainer? A: Persons interested in becoming a trainer will have to contact a course developer of an approved course to complete required training to train that approved course. This must be done prior to completing the requirements posted on the website. Q: Can I become a trainer even though I am not a Certified Peer Support Specialist? A: No. In order to become a Peer Support Specialist Trainer, you must be a certified and maintain certification as a Peer Support Specialist.